The Counselors Title LLC office in the Kentlands is managed by one of our principals, Colleen Smyth, Esquire. Noreen Hathaway, Esquire is also based in the Kentlands. Together, Colleen and Noreen, can help you with any of your settlement needs, whether it is advice on matters of contract, title or settlement. Together with their friendly and experienced staff, Colleen, Noreen and the entire Kentlands office strive to make every settlement professional and enjoyable for all parties. We offer personalized service to all of our clients and strive to make their settlement transaction accurate, pleasant and seamless. The Kentlands is a planned community development located in Gaithersburg, Maryland. Our street front office suite is located within The Colonnade Condominium. We are located at the corner of Great Seneca Highway and Quince Orchard Boulevard. On street parking is conveniently located directly in front of our office or in the open lot next to our building. Please note that our physical location and office entrance do not share the same address. 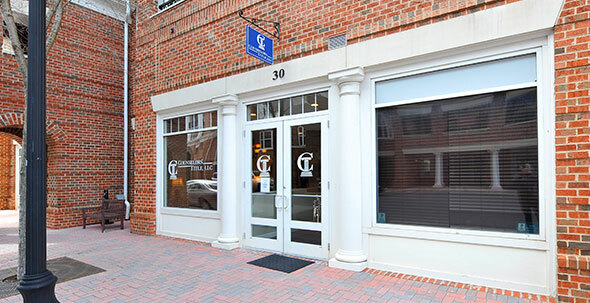 Our entrance is located at 30 Arch Place, Gaithersburg, Maryland. Most GPS systems require the entry of 23 Arch Place in order to provide accurate directions. Directions can be obtained by clicking on the “Directions” link below.